Much is being made this political season over the stagnant incomes of middle-class workers and what can be done to improve their living standards. Solutions have ranged from more targeted tax cuts—such as “payroll tax cuts, family-friendly tax reform, wage subsidies or a larger earned-income tax credit”—to more government benefits, such as free college tuition and job training programs. What’s interesting about this discussion is that more government policy has been aimed at the middle-class over the past 25 years than perhaps at any time in history. This help has come in the form of both tax cuts and spending programs. On the tax side alone, there has been an explosion of tax measures aimed at working-class households. 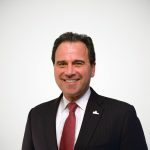 A few examples include the Child Tax Credit, the expanded Earned Income Tax Credit (EITC), the American Opportunity Tax Credit, the Health Insurance Tax Credit, the First-Time Homebuyer Credit, and the adoption credit. Many of these tax credits are “refundable,” meaning the taxpayer still gets the full cash value of the credit even if they don’t have a tax liability. New data from the Congressional Budget Office (found on Tab 6 here) shows that over the last 35 years pre-tax incomes of the middle class have not increased. 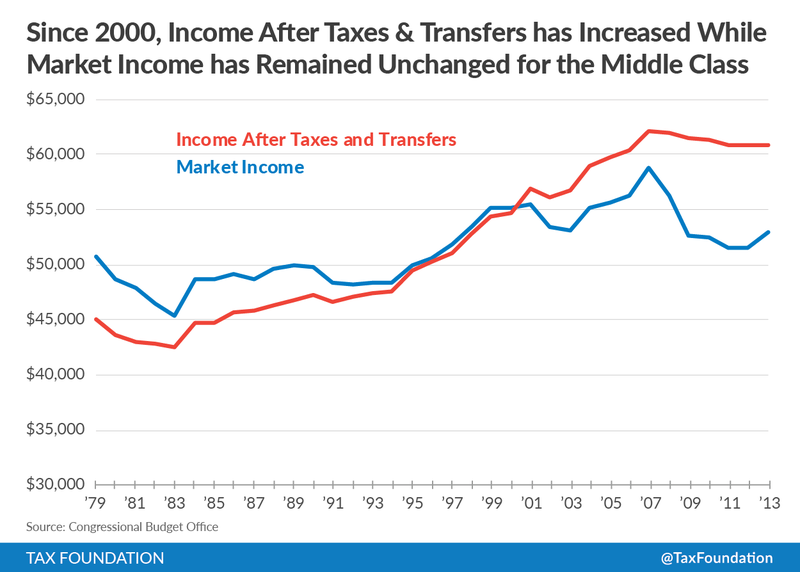 Most of the income growth of the middle class is due to transfers (after taxes). As a proxy for “middle-income,” or “working-class” Americans, we’ll focus on those households comprising the middle-fifth of CBO’s income distribution. In 2013, these households had an average “market” income of $53,000. Market income includes labor income, business income, capital gains, capital income, but no government transfers. Chart 1 gives us a 35-year picture of the growth in federal transfer programs targeted at these middle-income households and compares those trends to the total amount of federal taxes they paid. In 1979, these households paid an average of $10,500 in federal taxes (in 2013 dollars), while the government directed an average of $4,700 in transfer benefits toward them. (Transfers include programs such as Social Security, unemployment benefits, Food Stamps, school lunch programs, as well as the cash value of healthcare programs such as Medicaid and Medicare.) At the end of the Carter administration, middle-income families paid roughly $2 in taxes for every $1 in federal benefits they received. As Chart 1 shows, for nearly twenty years, the tax burden on middle-income families remained fairly stable but the amount of transfer programs aimed at them grew considerably. As a result, by 2000, the average amount of transfer programs benefiting the middle-class equaled the average amount of taxes they paid; $10,400 in benefits compared to $10,900 in taxes paid. Since then, the gap between the amount of taxes paid by middle-income families and the amount of transfer benefits spent on their behalf has grown considerably. Starting in 1997 with the enactment of the $500 per-child tax credit, successive tax cuts aimed at the middle class reduced the tax burden on middle-income households. (The 2001 Bush tax cuts doubled the value of the child credit to $1,000 and made it refundable.) Indeed, between 2000 and 2013, the total federal tax burden on middle-income households fell in real terms by 18 percent, or $2,100. The amount of transfer spending aimed at those households grew by 61 percent during the same period. In 2013, according to the CBO, Washington spent roughly $2 in transfer benefits on middle-class households for every $1 of federal taxes they paid; $8,900 in taxes compared to $16,700 in transfers. 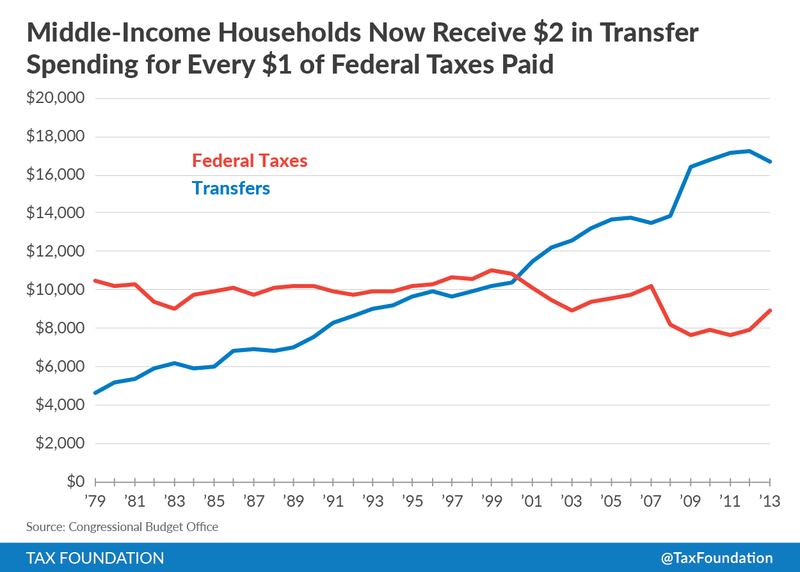 Tax and spending programs have lifted after-tax incomes. However, pre-tax incomes did not keep pace. Chart 2 shows that when the CBO accounted for the tax cuts and transfer spending benefits aimed at them, the incomes of middle-class households increased in real terms from $54,700 in 2000 to $60,800 in 2013, or 11 percent. The chart also shows that since 2000, market incomes for the middle class have been volatile. They dipped following the 2001 recession, then peaked in 2007, only to fall steadily since the 2008 economic downturn. After all those ups and downs, by 2013 the market income for middle-income households stood at $53,000, roughly the same level it had been a decade earlier. It is particularly worrisome that pre-tax market income has not significantly increased over the past 35 years. Perhaps this explains why the middle class is so unhappy this election season. This suggests that different policies are needed to boost pre-tax incomes; policies that would encourage investment and increases in productivity growth.